Students in the sixth grade are expected to be able to recognize various aspects of literature. In a language arts classroom instructors may show films of famous works of literature (such as a Shakespearean play). Before playing the film in class teachers may present their students with a worksheet that asks them to identify different devices within the play (eg. Stock character, antagonist, protagonist, climax, denouement…etc.). Students should be expected to complete the worksheet as they are watching the film. 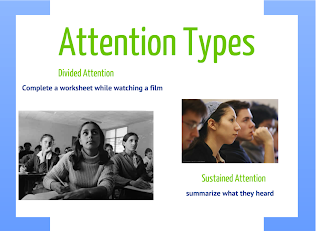 This activity will require students to use selective attention, as they will have to select the relevant parts of the movie to which to attend. Another activity English teachers may choose to incorporate into their classroom is to read lengthy passages or poems to their students. While reading the passage instructors may ask all of the students to pay close attention to the details and message of the passage. When finished reading the teacher would ask the students to respond to the reading by summarizing what they heard and explaining what it meant to them. 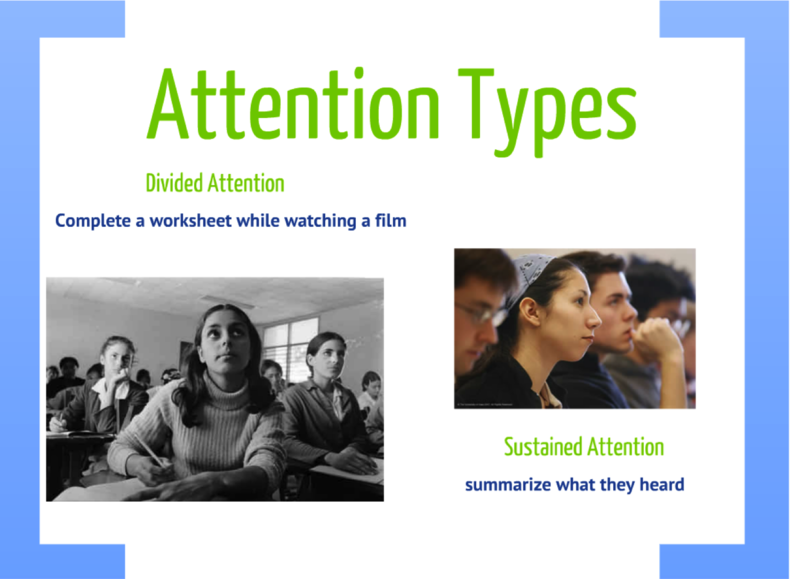 In this activity students will be practicing their ability to maintain sustained attention. They will need to be able to follow along with reading in order to respond accurately.